Dullstroom in Mpumalanga is a very popular tourist destination. Over weekends, travelers from Gauteng visit the area to indulge in the natural beauty. 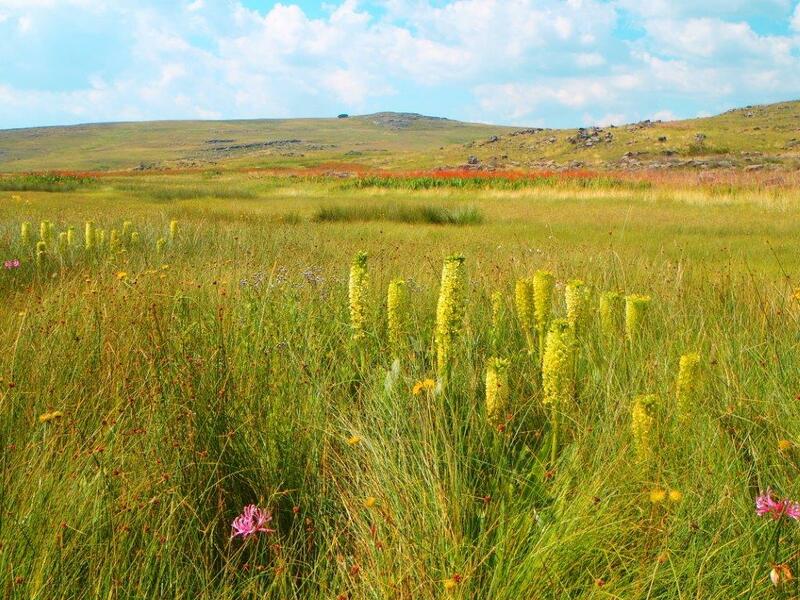 Dullstroom is situated 2,100 m above sea-level, making it one of the highest (and coldest) towns in South Africa. Trout fishing is the premier activity, but there are much more. Being halfway between Johannesburg and the Kruger National Park, only 250km from Johannesburg/Pretoria, mostly along the N4 high-way, Dullstroom is the ideal stopover for mountain biking, hiking, birding, or just walking the streets and visiting all the unique and interesting shops and stores. 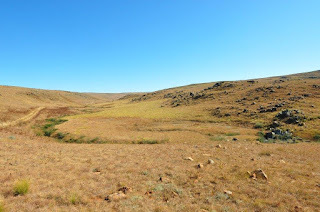 Verloren Valei Nature Reserve is situated 15 km north of Dullstroom on the gravel road that connects the R540 and R577. This 6,000ha reserve is famous for the numerous species of ground orchids and other plants that present a spectacular display of indigenous flowers in summer (Oct - Feb), attracting butterflies of all kinds. But it is the unique wetland system in the reserve that makes this possible. 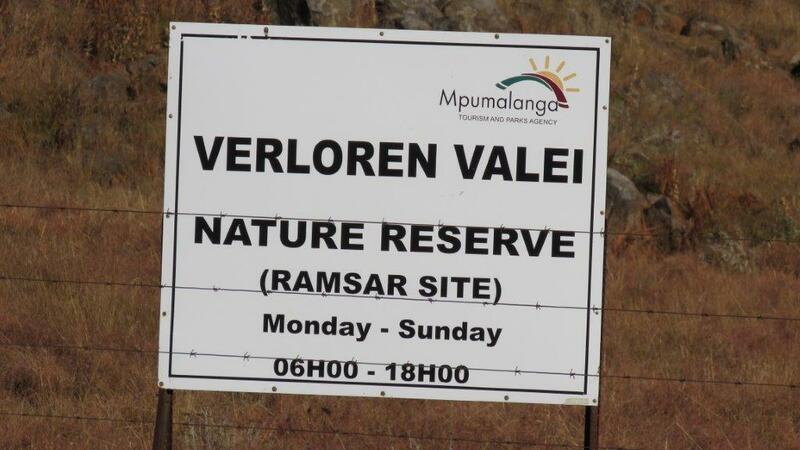 More than 30 different wetlands of all types except pans (floodplains, channeled and unchannelled valley-bottoms, depressions, flats, seeps, rivers), make up the Ramsar wetlands which received its status of International Importance on 16 October 2001 – the only Ramsar wetland in Mpumalanga. With no pollution, erosion or alien plants, the water is crystal clear and sweet. 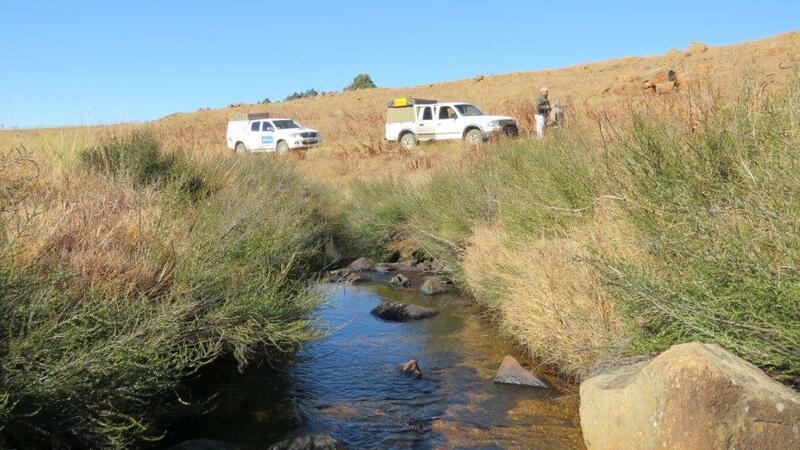 At an altitude of more than 2,000 meters, average temperature ranges from -13 °C to 29 °C, and a high average rainfall of more than 800mm per year, Verloren Valei is the source of the Lunsklip River, a tributary of the Crocodile River. 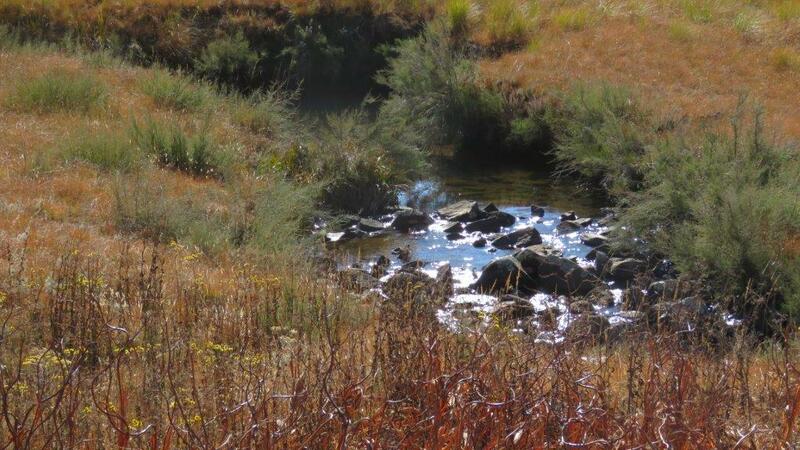 Water from the wetlands also contributes to the Olifants River. 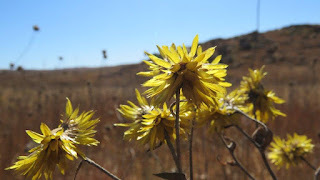 Verloren Valei Nature Reserve is part of an Important Bird Area (IBA SA016) boasting birds such as Grass Owls, Marsh Owls, Long Claws, Rock Thrushes, and the extremely rare White-winged Flufftail. It is also a breeding ground for Rudd’s Lark. This is the only region in South Africa with breeding populations of the endangered Blue Crane, Crowned Crane as well as the Wattled Crane. Yellow-breasted Pipit is fairly common. Southern Bald Ibis breeds in at least two colonies within the IBA, and the birds roost and forage throughout the area. Denham's Bustard, White-bellied Korhaan and Black-winged Lapwing are found in low numbers throughout the region. Game that can be seen in the reserve include Black Wildebeest, Oribis, Zebras, Blesbuck, Grey Rhebuck, Duiker and Mountain Reed Buck. Verloren Valei is not really equipped for individual tourist visits. The roads inside the reserve are jeep tracks that require good ground clearance and even 4x4 capabilities in places, especially when wet. It is however, very well suited for guided group visits. Groups of students, botanists, ornithologists and photographers are regular visitors. Walking, cycling and self-drive are allowed inside the reserve. No water activities or fishing is allowed. 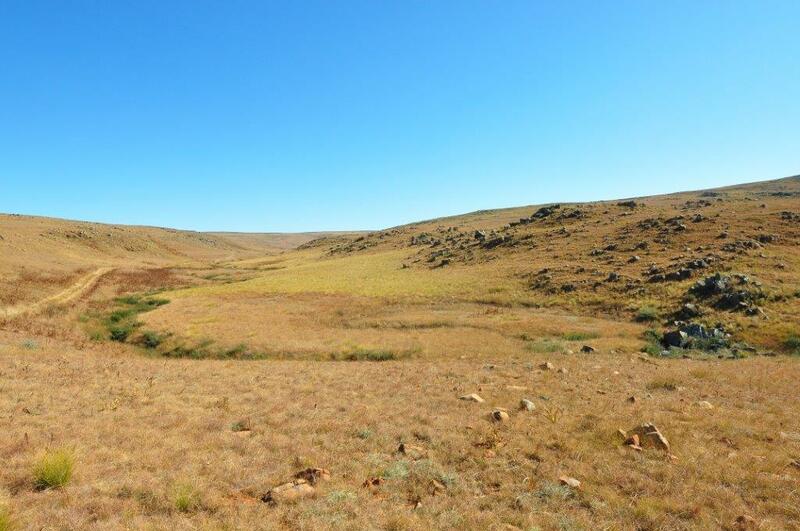 Good co-operation with neighboring property owners are essential on these grasslands. 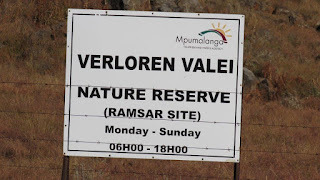 This does appear to be the case with the Verloren Valei Nature Reserve and it is most evident with fire prevention, fire management and fire monitoring. A big threat to the future of the reserve as we know it today, is a constant flow of open-cast coal mining applications. I do hope that the conservationists who fight these applications to protect Verloren Valei will outlive the greedy, short-sighted industrialists, often partnered by naïve and opportunistic politicians. Poaching of small antelope and medicinal plants are also smaller, but real threats. An interesting event that is regularly held at Verloren Vlei, is the field trials of the Transvaal Hunt, Point and Retrieve club. Well disciplined pointer dogs, mostly German Short-haired Pointers, show their worth in this well controlled environment and assist Birdlife SA with bird counts for some of the rare species. There are no accommodation or other facilities inside the reserve. But Dullstroom and its surroundings offer a lot of accommodation options, from basic camping to ultra luxury establishments. This is also evident from the multiple ‘accommodation booking agencies’ rather than Information centres in town. We stayed at Linger Longer, a trout fishing farm right next to Verloren Valei, and were very impressed with the quality and class of the self-catering chalets, not to mention the magnificent views over the valleys and trout dams that we enjoyed.